Friday was the husband’s birthday and we celebrated in typical fashion (for us) by making homemade pizza and watching March Madness. Followed by copious amounts of chocolate cake and mint chocolate chip ice cream. We’re so exciting, no? Actually it was perfect. We sat on the patio, talked, ate and laughed. Birthdays rock! But I wanted to share one of the pizza recipes we made. Allena are you listening? I love (let me actually say LOVE) butternut squash and I am sad the winter squash season is coming to an end. But I still have a few winter squashes and wanted to put them to good use. I loosely followed the recipe from Real Simple (love them by the way) for Butternut Squash Pizza. And oh. my. goodness. This is fabulous! Heat oven to 400. Cut the squash into 1-inch chunks. Place the squash and onion on a baking sheet. Drizzle with the oil, season with the salt and pepper, and toss. Roast until tender, about 20 minutes. Transfer to a plate. Increase oven temperature to 450° F. Roll the dough out 1/4 inch thick. Clean the baking sheet and sprinkle it with the cornmeal. Place the dough on top. 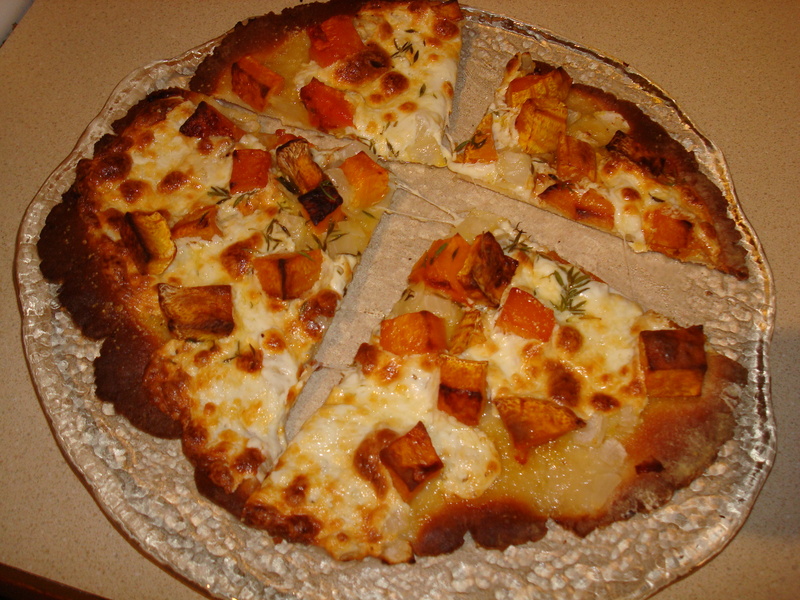 Scatter the squash and onion mixture over the dough, sprinkle with the thyme, and slices of mozzarella. Bake until golden, about 25 minutes. Slice into wedges. Preheat oven to 400 degrees. Prepare pizza pan by spraying with non-stick cooking spray. Combine dry ingredients in mixing bowl. Add liquids and stir to incorporate dry ingredients. Knead dough by hand 6-8 times on a lightly floured surface. Roll dough thinly. Place rolled dough onto prepared pizza pan. Brush crust with olive oil and add favorite sauce and toppings. Bake at 400 degrees for 18-20 minutes, depending on crust thickness or according to pizza recipe directions. Did I mention that birthdays rock? Birthdays do rock. Very Happy Birthday to Keith. One of the best pizzas that I’ve ever made involved butternut squash, gorgonzola, and caramelized onions. OMG. It was really good. I have found that the key to good pizza is fresh mozzarella. I don’t know how I ever used the bagged pre-shredded cheese for so long! The original recipe called for ricotta but I am not a huge ricotta fan (I find it kind of icky) so I used the mozarella instead. YUM! That definitely sounds like my kind of celebration! Chilling with a loved one and good food? Yep! Pizza!!! Did you know that you can save and store winter squashes for like 6 months? YOu can have them all summer! Mint chocolate chip is my favorite ice cream. I need to make some very soon. You know how to make it?? I may never leave in May. Butternut squash pizza? That sounds amazing. Thanks for the crust recipe. I’ve always wondered how the crust would turn out without the yeast hey “bread” is bread. Put sauce and squash on it and it’s gold! I’ve been meaning to comment for a while now, but just wanted to say WELCOME BACK!! 😀 So glad to see you “around town” these days! 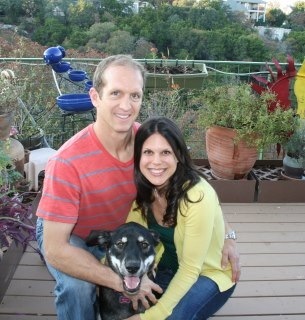 I was so thinking of you as I wrote my post about Shanna. 🙂 And then it made me want to borrow ‘Christmas’. Sometimes we are two peas in a pod!! Will definitely be trying out at least the crust in this recipe! 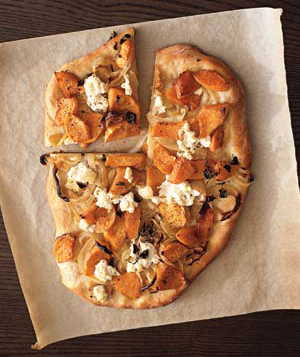 i looove squash on pizza – these look heavenly! Love your blog! You and your hubs celebrate just like my boyfriend and I would! We made homemade pizza allll the time but we watch baseball instead of basketball.